Gypsy teenage to-be brides gather every year at an open-air market for Roma brides in the village of Mogila, Bulgaria. Hundreds Roma from the southern parts of Bulgaria meet to celebrate the Day of St. Todor. 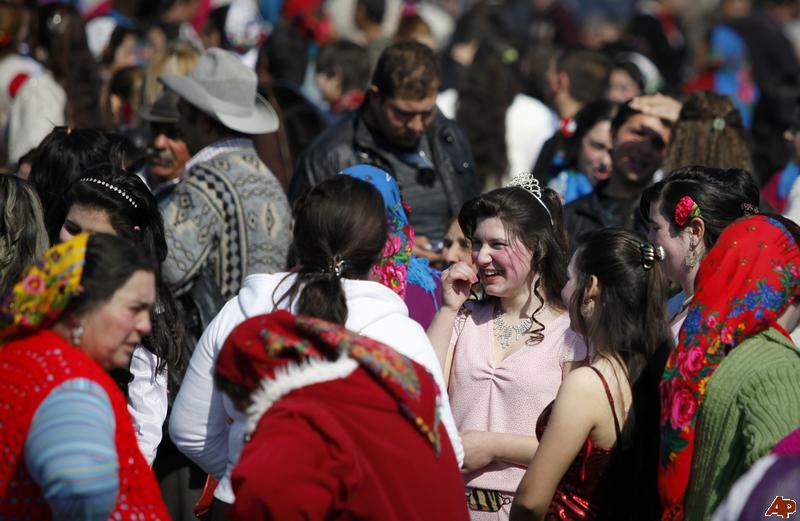 At this traditional gathering, taking place on the first Saturday after the start of the orthodox Easter fast, the Roma families expose their teenage daughters with the intention to find a husband for them who is willing to pay a large amount of money for his future wife. At this bride market the price of a beautiful young woman is said to be several thousands euros. Money, not love, is the first priority. Girls are only allowed to be married within specific clans. The brides range in age from 14 to 20 years old, and the brides’ families are in control. The value of a bride is conserved as far as her virginity is preserved. Metropolis is a Dutch web-based network, broadcasting interesting — and often controversial — reports. Here is Metropolis video on the Bulgarian Bride Market (Brides for Sale): eight minutes and forty five seconds, of well spent time. If then you get interested in the topic, this other video report present another aspect of the same story: how Roma mothers educate their daughters to the value of virginity. ← A girl, and her room.